This is a compelling mystery series and I can't wait to read more! It's not often that I want to re-read mystery books but I already sense that I will revisit Inspector Gamache again. This second in the series is about words--from hidden meanings to literally written on the wall. And the setting of Three Pines, Quebec, Canada, is as a character, too. When Chief Inspector Armand Gamache, of the Sûreté du Québec, is called to investigate, he quickly realizes he's dealing with someone quite extraordinary. CC de Poitiers was electrocuted in the middle of a frozen lake, in front of the entire village, as she watched the annual curling tournament. And yet no one saw anything. Who could have been insane enough to try such a macabre method of murder—or brilliant enough to succeed? “Let every man shovel out his own snow, and the whole city will be passable," said Gamache. Seeing Beauvoir's puzzled expression he added, "Emerson." Before I read her latest book, I went back and re-read the entire series. Like you, I am an avid reader and do not often go through books a second time. 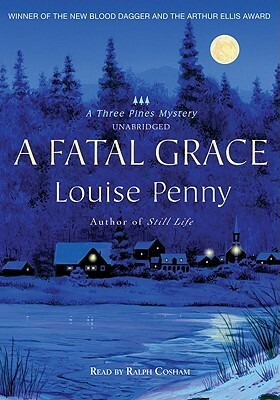 Louise Penny's books are worth it. In my opinion, Armand Gamache is the perfect man. I have thoroughly enjoyed this series and have started rereading them. Her stories are great, and I enjoy the characters and the community of Three Pines. A new book will be out in November, 2018, I believe.